Qualcomm has developed a 5.7-inch (1,024x768) display for ebook readers that not only renders color and video; it does so with enough power efficiency to challenge a black and white, still-frame Kindle. The "mirasol" technology mimics iridescent butterfly wings by deploying charged, color-inducing membranes over a layer of mirror. 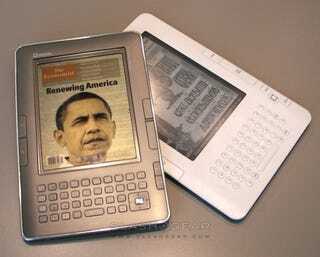 It's a technology that, if integrated into Kindles today as-is, would increase battery life by an estimated 20%. Instead, Qualcomm uses that extra power efficiency to drive color and higher refresh rates for smooth video. They contend that a Kindle with their more media-capable display could run about a day with its current battery.